Increase your sales using Seljax 3D Stud Frame Estimating and Design software. 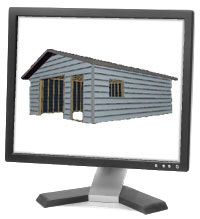 Bring your customers’ stud frame building to life in minutes with a full 3D rendering. Zoom inside the building to view the framing and detail. Quickly modify the image to fit your customes’ specifications, right before their eyes. Selling is easier when they can see what they’re getting before they buy it. The effectiveness of 3D design comes from the opportunity to visualize—viewing it makes it reality for a customer. Work closely with your customers designing exactly what they envision for their new building. The sales process is faster and more efficient. Customize your customers’ buildings within minutes. Seljax Estimating is a built-in component of 3D Stud Frame Estimating and Design. 3D Stud Frame is a complete package that gives you the power to design and modify stud frame buildings, and then calculate the estimate from the 3D rendering. The speed and accuracy is always apparent, allowing you to create an exceptional 3D estimate.